We appreciate your interest in our website and our company. The protection of your personal data during your visits to our website is of great importance to us and we are fully committed to protecting your personal data. We are taking your privacy very seriously, especially, as concerns the collection, sharing, processing, and utilization of your personal data when you visit our website. If you have any questions regarding the protection of your personal data or this privacy statement, please do not hesitate to contact our data protection officer at irenejsj@yahoo.co.uk. We will be pleased to inform you about your personal data stored in our database. Mere use of our website or reading this privacy statement shall not be deemed replace the consent we are required by law to obtain from you in order to collect, share, process, and use your personal data in the form indicated below and for the purposes mentioned below. In addition, we would like to emphasize that you have the right to withdraw the consent you have given with respect to the collection and use of your data at any time with future effect. Experience has shown that privacy legislation is subject to regular revisions, which may require adjustments to our privacy statement. The contents of our website are also frequently updated for changes and improvements. We therefore reserve the right to adjust the present privacy statement accordingly and to send you information about changes to our privacy statement if required. In addition, you are kindly invited to regularly visit our website to get informed about modifications of our privacy statement or other terms and conditions of use of our website. Please be assured that we will not change our privacy statement in any material way that might lead to an increased use of your data, unless you have given your consent to such use. Below you will find some information about which personal data are recorded during your visit to our website and how we use them. Every access to our website (including its sub-pages) will be captured and recorded automatically. In particular, the system can capture and record the IP-address of the computer submitting a query. In the same way, every time you are clicking on, downloading, or otherwise accessing any file on our website, your data will possibly be captured and recorded. The following data will be recorded: file name; date and time of access; volume of data accessed or transferred; browser used; information on whether the access and/or transfer was successful; the name of the domain or e-mail submitting the query. Any e-mail receipt or read confirmations may also possibly be captured and recorded. b) None of the above-mentioned data – except for the domain submitting the query or your e-mail address – will allow us to identify you personally. The above data collection is not prescribed by law or contract and is not required for concluding a contract. You are not obliged to provide the above personal data. If you do not provide the data, however, you may actually no longer have access to all of the functions provided by our website. Any personal data other than those specified in the previous section will only be collected and stored by us if you have provided them voluntarily, e.g. by sending us an e-mail query or by providing your contact data in connection with advertisements you wish to serve on our website. The legal basis for processing personal data in this context is Article 6 (1) a) GDPR. You have the right to withdraw the consent you have given with respect to the recording of your data at any time with future effect. a) We will only use any personal data you have transferred or communicated to us for answering your inquiries, performing contracts to which you are a party, processing orders you have placed with us, or for the purposes of our technical administration, accounting or invoicing processes. The applicable legal bases in this context are Article 6 (1) a), and alternatively also, b), c) and f) GDPR. We will not disclose or otherwise transfer any of your personal data to any third party, unless (i) this is required for performing a contract or for invoicing purposes or (ii) you have previously given your consent or (iii) we are entitled or required to do so under applicable legal provisions. The applicable legal bases in this context are Article 6 (1) a), and alternatively also, b), c) and f) GDPR. You have the right to withdraw the consent you have given us at any time with future effect. b) In case of a legal conflict with a user, we may also share your personal data with our attorneys (www.zellerseyfert.com) or with law enforcement. The applicable legal basis in this context is Article 6 (1) f) GDPR. We do not transfer any data to third countries or to international or cross-border organizations. Should the transfer of data to a third country or to an international or cross-border organization be necessary, such transfer will be performed as permitted by applicable law only. The legal basis for processing personal data in this context is Article 6 (1) f) GDPR. If you withdraw your consent, we will delete your personal data immediately. See Art. 7 (3) GDPR. The data will also be deleted if we no longer need to know them for fulfilling the purpose for which they were stored or if storage of the data is or has become inadmissible for any other legal reasons. a) Upon request, we will be pleased to inform you about your personal data stored by us, including their origin, recipients, and the purpose for which they are stored. See Art. 15 GDPR. c) In addition, you have the right to lodge a complaint with a supervisory authority (Art. 77 GDPR). Please be assured that we will protect your personal data stored by us from illegal espionage by third parties as far as such protection is reasonably possible using modern technical and organizational means. However, whenever we contact you or you contact us by e-mail, we cannot guarantee full data security despite various safeguards employed by us. We therefore recommend you to send any confidential information by ordinary mail. a) Our website uses so-called session cookies. Session cookies are managed on the server and not saved to the hard drive of your computer. Session cookies make navigation easier during your visit to our website but immediately cease to be valid when you leave our website. If you visit our website again, the server will create a new cookie, which will also cease to be valid when you leave. Consequently, session cookies do not allow us to identify visitors to our website or the personal data of visitors to our website. If you do not want to accept any cookies, not even session cookies, the help function in most browsers (usually represented by a question mark icon) will show you how to change the browser settings to accept no new cookies when using the internet. Many browsers can also be set to automatically notify you when a new cookie is being set. Usually, your browser’s help function will also provide instructions on how to delete all cookies set on your computer. Some browsers can be set so that no cookies are set or accepted on your computer, unless the respective inquiring address is permitted according to your specifications. a) Our website uses Facebook plugins. A plugin is a software component, which – during its runtime – can be detected and integrated by a software application to add specific features to the software application. The Facebook plugins are operated by the social network Facebook Inc. 1601 S. California Ave, Palo Alto, California 94304, USA (hereinafter “Facebook”). The Facebook plugins used on our website are identified by the Facebook logo (white “f” on blue tile), by the suffix “Like”, or the “thumbs up” symbol, or the suffix “Facebook Social Plugin”. Whenever you visit our website or any of its subpages that contain such a Facebook plugin, your browser creates a direct connection to the Facebook servers. In this way, the content of the Facebook plugin is transmitted to your browser which integrates it into the displayed webpage and/or subpage of our website. Once the plug-in has been installed, Facebook is notified that you have visited our website or the respective subpage of our website. Please be aware that Facebook can match the visit to your Facebook account, if you are logged in to Facebook during your visit to our webpage and/or any subpage of our website. If you interact with Facebook plugins, by clicking the “Like” button or commenting, for example, the corresponding information will be transmitted directly to Facebook, where it will be stored and processed. It cannot be ruled out that Facebook will find out and store your IP address even if you have no Facebook user account. If you have a Facebook user account and do not want Facebook to collect personal and/or other data on you via our website and to link said information with the membership data about you stored by Facebook or to process and use said information, you need to log out of your Facebook account before visiting our website. You can also block Facebook plugins on your browser by using certain add-ons, like the “Facebook blocker” add-on (see, for example, at http://webgraph.com/resources/facebookblocker/). b) The legal basis for our use of Google Analytics as mentioned under a) is Art. 6 (1) f) GDPR (processing is necessary for the purposes of our legitimate interests). If you subscribe to our newsletter or have already subscribed to it, we process your personal data to send you information about our offers or news by e-mail. By signing up for our newsletter, you give us permission to send you our newsletter. You can revoke this consent at any time and without stating reasons with effect for the future. See Art. 7 (3) GDPR. The legality of the data processing up to the revocation remains unaffected in case of revocation. The processing of your personal data takes place on the basis of your consent pursuant to Article 6 (1) a) GDPR. In order to unsubscribe from our newsletter, it is sufficient to send a message to our responsible department (see above under 1.). Are you “in” or “out” of tune? es ist mein Anliegen, so vielen Menschen wie möglich zu helfen. Aus diesem Grund habe ich diesen freiwilligen Sponsor-Button eingerichtet, über den Ihr mir einen Betrag nach Eurem Ermessen überweisen könnt. Jede noch so kleine Summe ist hoch geschätzt und ich danke Euch im Voraus für Eure Hilfe, die es mir ermöglicht, auch weiterhin für Euch da zu sein! LIBRA stands for BALANCE and HARMONY! Go to page 183 in my book "Feeling Great with the Moon" to get the detailed info on this energy and how to activate it! See also the photograph below taken from the book for the activation sequence. (Switch hands for the other side). Activating your Bladder Energy helps the above mentioned aspects, opens your Heart Chakra, clears your back, harmonizes your emotions and helps any back problems! 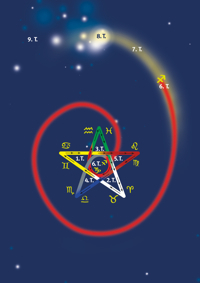 The Moon is your Key to Total Health and Happiness and the five-pointed star is the symbol of Total Health! Follow me and the moon on instagram or on facebook on my English-speaking page Irene Lauretti.